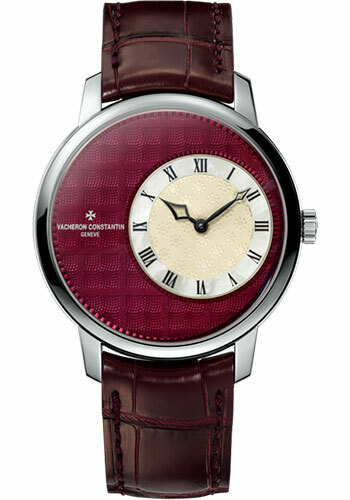 39.00 mm 18K white gold case, 8.20 mm thick, transparent sapphire back, Prince of Whales check pattern dial, Caliber 1400 manual-winding movement with hours, minutes, approximately 40 hours of power reserve, burgundy alligator Mississippiensis strap, 18K white gold ardillon buckle. Water resistant to 3 bar. delivered with a magnifying glass. 39.00 mm 18K white gold case, 8.20 mm thick, transparent sapphire back, tartan pattern dial, Caliber 1400 manual-winding movement with hours, minutes, approximately 40 hours of power reserve, black alligator Mississippiensis strap, 18K white gold ardillon buckle. Water resistant to 3 bar. delivered with a magnifying glass. 39.00 mm 18K 5N pink gold case, 8.20 mm thick, transparent sapphire back, herringbone pattern dial, Caliber 1400 manual-winding movement with hours, minutes, approximately 40 hours of power reserve, dark brown alligator Mississippiensis strap, 18K 5N pink gold ardillon buckle. Water resistant to 3 bar. delivered with a magnifying glass. 39.00 mm 18K 5N pink gold case, 8.20 mm thick, transparent sapphire back, windowpane pattern dial, Caliber 1400 manual-winding movement with hours, minutes, approximately 40 hours of power reserve, light brown alligator Mississippiensis strap, 18K 5N pink gold ardillon buckle. Water resistant to 3 bar. delivered with a magnifying glass. 39.00 mm 18K 5N pink gold case, 8.20 mm thick, transparent sapphire back, tennis stripes pattern dial, Caliber 1400 manual-winding movement with hours, minutes, approximately 40 hours of power reserve, dark brown alligator Mississippiensis strap, 18K 5N pink gold ardillon buckle. Water resistant to 3 bar. delivered with a magnifying glass.